The success of a company is not merely dependent on one factor; rather it is dependent on a number of factors. One of the chief things that contribute to the success of a company is the capability of the employees to work as a team. If the employees do not work as one comprehensive unit, then the company will never be able to achieve success. If you as the boss or senior in your company notice that the employees are not being able to break the ice and work together as a team then given here are some team building activities for employee engagement. Owing to the fact that it has become so easy to access the internet on the go, almost seventy percent of people who access the net are active on at least one social networking site or the other. The most popular sites include, Facebook, Twitter, Instagram etc. To encourage team building among co workers, one great activity includes, making use of social media sites to ensure that the employees are in contact with one another and are able to get to know each other a little better. Team members can interact through private Linkedln groups if they would wouldn’t like to be Facebook friends. The best way for team members to work well with one another is to get them to bond outside their work roles. The more they interact with one another, the better will they be able to function together as a single unit. So even the top virtual teams, take the time out to get to know one another better by indulging in some coffee breaks or even happy hours. Attendance to these coffee breaks need not be made compulsory; rather the team members should be encouraged to participate on their own. This way they can also get to know whose interests and abilities lie where. For any team to work in a proper manner it is of paramount importance that the team is led by some efficient leader. Chances are that if the leader isn’t good then the group might just fall apart all together. In most of these high performance teams with remote employees, there isn’t exactly such a dire need for a leader especially because everyone is more than capable of functioning independently, so that is why rather than having a single leader it is better to have the practice of rotational leadership as everyone gets a chance to feel a vital and necessary part of the group. Having ice breaking sessions with a purpose goes a long way in team building, especially when the employees are remote. One of the best activities can be to ask another employee what he would act or react in a particular situation and the answer provided will really give you an insight into how the individual handles conflicts as well as comes up with solutions. You can also break down the group into partners and see how each team is able to function. How many individuals are able to work well with a partner where as how many teams are looking flustered? All employees have their own unique style of functioning however when it comes to working in a team, everyone cannot simply work in any and every way, rather everyone should try and adhere to a particular set of rules so that no ill will is generated nor does anyone end up losing their temper. An team activity which has proved to be both effective as well as effectual is the activity which entails the employees, on their very own coming up with a charter which they will have to adhere to at all costs as well as under all circumstances. Remote employees will never be able to grow as a team if each of them is merely chasing after their own selfish needs and wants; a great way to encourage team building is by encouraging the practice of shared learning. This practice is very similar to what happens in a book club where everyone is made to read the same book and after a week or so everyone is made to put forth their thoughts about the books and state categorically whether they liked it or not. Shared learning involves the same thing only about work related books and theories. Webinars are online seminars which are educational as well as interesting. Once these remote employees have attended these webinars they can have a group discussion where each of them places their thoughts on what they thought of the lecture which was delivered. Everyone will certainly not have the same things to say, but this activity helps in team building events as it encourages these employees to get an idea of how other people process a piece of information as well and what observations they are able to come up with. The following mentioned are few tips on team building activities for work for large group of employees. At some point of time or the other, all of us have enjoyed the outdoor activity by the name of tug of war, which engages a large number of people and also helps a great deal in team building. So if employees at the office are being unable to break the ice between them all you need to do is organize this fun team building activities and before you know it everyone will be laughing and joking as well as coming up with ingenious team building ideas to help defeat the other team. Sometimes it is absolutely vital to allow the team members to bond outside work then only will they get used to one another. A great activity to encourage team building in the workplace for a large group of employees is a scavenger hunt, where the employees are broken up into a number of groups and are made to go on a treasure hunt of sorts where they will be required to solve some riddles as well as puzzles so as to reach the finish line first. It is important to note that in the course of these fun team games it does not matter who is winning to who is losing, it is more important to ensure that everyone is having a good time and getting to interact with those people who they generally may not be even speaking to. This is a kind of group activity. The great thing about this activity is that it certainly does not take very long at all, yet at the same time a number of people can participate all at once. In terms of preparations all that you need to do is to have four signs made at four corners of the room Initially music is played and as the music stops individuals are meant to run to one of the four corners. Once everyone has taken their place, a card is picked up from a bag and whichever card is picked up all those players at that corner are out of the game. This is repeated till there is only one winner. This game is indeed an enjoyable one. As we grow up and become career oriented we forget what it’s like to have fun and simply let go. Our busy schedules do not even allows us to get to know the people who sit beside us in the office. To facilitate team building, a sports day should be organized where there will be different sports events and everyone will have to participate in some form or the other. No matter what you ranking in the office, all differences get erased on the sports field and all the employees just want to have a good time and have a little fun on their day off. Charades is a game which most of us know and even for employees it serves as a great way for team building. Encouraging your employees to work as a team is the only way which the company will be able to become bigger and better over time. Employees will never be able to reach their full potential or deliver top quality work as their minds are constantly caught up in negative thoughts pertaining to work place politics or even thoughts like ‘how can I over take my rival’. Breaking down these barriers is vital so as to bring out the best in each employee in the large group. 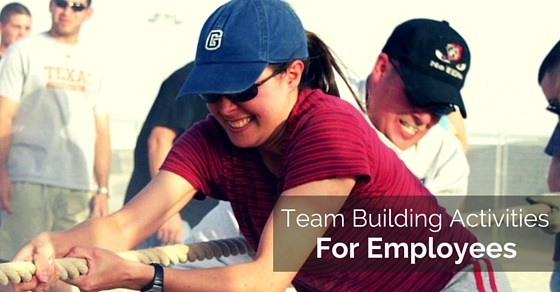 The following mentioned are few ideas for team building process for difficult employees. To encourage team building, it is absolutely vital to put all the difficult employees in the same group such that they are made to work together and be polite with one another even if they do not necessarily agree with the other person’s point of view. The more these employees interact with one another, the better will they be able to interact with one another during group projects or when work has been assigned to the employees. However just so that things do not go out of hand ensure that you have your eye on them at all times as trust building activities like these become an ego battle too sometimes. A great thing which can really go a long way in encouraging quick team building activities between employees is by playing a round or two of truth and dare, just as an ice breaking session of sorts. Chances are that if you take all the right steps then even the most difficult employees can come together and function as one team. All you have to do is encourage them to think that everyone is equal and has his or her own unique talents and abilities, each employee forms an indispensable part of the office and without the contribution of each one, things are never going to function smoothly. Having one difficult employee is bad, but dealing with more than that becomes even tougher. An activity which has proved to be highly effective for team building for difficult employees is placing all these employees in a room and encouraging them to converse with one another and if problems exist then to talk them out as well. Employees should realize that they might not always be able to see eye to eye with one another, yet that does not imply that they do not respect each other’s points of view. Being tough and unaccommodating is never going to get anyone anywhere. Last but certainly not the least is that difficult employees should be made to attend special lectures and seminars to encourage team building and ensure that employees learn to respect one another because at the end of the day they all have a common goal, which is trying to keep the company banner flying high at all costs. So these are some simple yet tried and tested activities which have been successful in team building. As a senior in the company you should not let this problem get to you in any way at all as this is a common problem indeed which many companies face, all it takes is a little effort on your part to eradicate this issue completely. However ensure that you do not take too long to take some necessary action as the more employees drift apart, the more difficult it is going to be for you to try and get even the simplest of tasks done. Next articleWhat is a Skill Based Resume? Is it Good for you?